At Ram Country Chrysler Dodge Jeep in Mineral Wells, you have the opportunity to check out one of the more stylish larger-sized sedans on the market. The Chrysler 300 is a roomy vehicle that has a track record of reliability. This vehicle has an exquisite exterior that is functional at the same time. The Chrysler 300 offers you the choice of nine different wheel options, so the vehicle can look the way that you want it to. Wheel sizes are available in 17,18,19 and 20-inch designs. 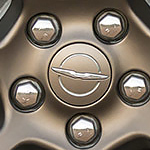 Some of the available designs feature multiple chrome spokes. Part of having great style means that the vehicle is also extremely functional. The Chrysler 300 offers high-intensity headlamps that look great and provide superior illumination. These headlamps also come with automatic high beams that switch between high and low light levels automatically as warranted by various driving situations. The Chrysler 300 is a versatile vehicle that looks great as well.